The House Energy and Commerce Committee is expanding its investigation into whether Health and Human Services Secretary Kathleen Sebelius broke the law when she asked health care executives to contribute to nonprofit groups that are helping to implement the Affordable Care Act. The committee has requested information from 15 companies and organizations that may have been approached by Sebelius. "Was your organization contacted by the HHS Secretary, any HHS employee, staff, or official, or any individual acting on behalf of HHS relating to contributions to assist in the establishment and implementation of the PPACA?" committee members asked in letters dated May 23. They also asked for documents and communications related to "any plans, commitments, or initiatives by your company to contribute to the implementation of" the Affordable Care Act, also known as Obamacare, as well as any information about meetings the companies and organizations may have had with the White House about the law’s implementation. Sebelius asked health industry executives to contribute to nonprofits that are working to enroll uninsured Americans under President Barack Obama’s health care reform law, the Washington Post first reported earlier this month. HHS confirmed that administration officials had been involved in fundraising in a capacity despite initially denying the reports, according to the New York Times. The administration says it was done in a personal, not official, capacity. Richard Painter, who served as Bush’s ethics counsel from 2005 to 2007, told the Washington Free Beacon last week that this appeared to be a violation of Office of Government ethics rules. "To me it’s a clear violation of the rules if you’re asking insurance companies to put money in," Painter said. According to ethics rules, federal employees cannot solicit money from a source that "does business or seeks to do business with the employee’s agency," "conducts activities regulated by the employee’s agency," or "has interests that may be substantially affected by performance or nonperformance of the employee’s official duties." The committee said it has requested information from Aetna, America’s Health Insurance Plans, Blue Shield of California, BlueCross BlueShield Association, CareFirst BlueCross BlueShield, Cigna, Coventry Health Care, Inc., H&R Block, HCSC Group, Highmark, Humana, Inc., Independence Blue Cross, Kaiser Permanente, United Healthcare, and Wellpoint, Inc.
A group of senators and congressmen, including House Energy and Commerce Committee Chairman Fred Upton, have also asked the Government Accountability Office to weigh in on whether Sebelius violated any laws. 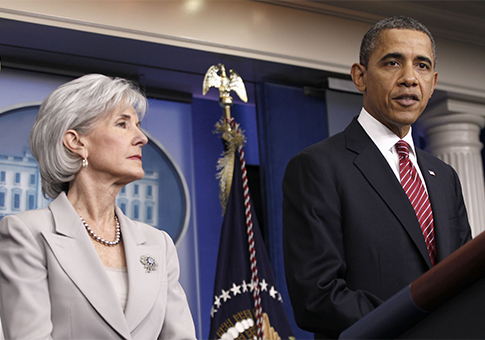 This is not the first time Sebelius has come under scrutiny for alleged ethics violations. The Office of Special Counsel concluded in 2012 that Sebelius violated the Hatch Act, which prohibits federal employees from engaging in political activity in their official capacity, after she gave a speech supporting Obama’s reelection at an event. This entry was posted in National Security and tagged Kathleen Sebelius, Obama Administration, Obamacare. Bookmark the permalink.